My short musical, “It’s the End of the World & I Love You” is being performed this week at the Kuala Lumpur Short & Sweet Musical Festival 2017. It’s being directed by fellow writer and director Terence Toh — though he admits this is his first hand at directing a musical. I think he’ll do great. I’m so sad that I won’t be able to see it live. But hey, there’s always video. And to commemorate the week, I’d like to leave the lyrics of the entire 10-minute musical below for your perusal. It’s a piece that is a lot of fun. I hope to get to produce it myself again in the future. Here you go. Enjoy! Synopsis: In the split second before an atomic bomb destroys the world, two lovers sing a 10-minute musical. Thank you, dear, I’m nearly ready to go. Now what do you suggest we do? Calm down. Calm down. I thought I gave that job to you. Calm down. Calm down. I’m all dressed up with nowhere to go. Take a deep breath we’ll go with the flow? Maybe the night will surprise us. I don’t like to be surprised. It’s the end of the world, and I love you! That at times he can be a complete idiot! Just what is a mushroom cloud? When I have resolve and rage in my heart. A thought I cannot bear. So let’s do what we couldn’t if we were just friends? You should ask her about Y2K. A case and a half every other day. Or live comfortably underground on 20 years of beans? When I would tell you you’re having a son. I’m happy to know, we’re a family when our life is through. My Play in Short & Sweet Kuala Lumpur: This Week! A brand new short play of mine will be one of the featured plays this week at the Short & Sweet Theatre Festival Kuala Lumpur. It’s a gritty piece called “Alone in a Bar,” about a desperate man in a bar, who comes in each day and drinks himself into oblivion. He never speaks a word, and he’s always distraught. On this particular day, another man and woman comes into the bar, and there seems to be some sort of abusive relationship going on, which brings some interaction with the silent man in the bar. It’s high tension and drama time! Director, Vinna Law, decided to go a little different route with the piece and made it into a type of experimental theatre, with the voices pre-recorded, and a sound-scape to set the mood for the choreographed actions. I haven’t seen it yet. You can get a sneak-peek glimpse at a rehearsal video on the Facebook link below. I’m flying down Friday to be there for evening show, and I can’t wait. It’s the third fifth time one of my plays or musicals have been in Short and Sweet KL, and I’m looking forward to it. Pictures and comments to follow this weekend. Drama directors, forensic coaches, drama teachers, or any lover of theatre. 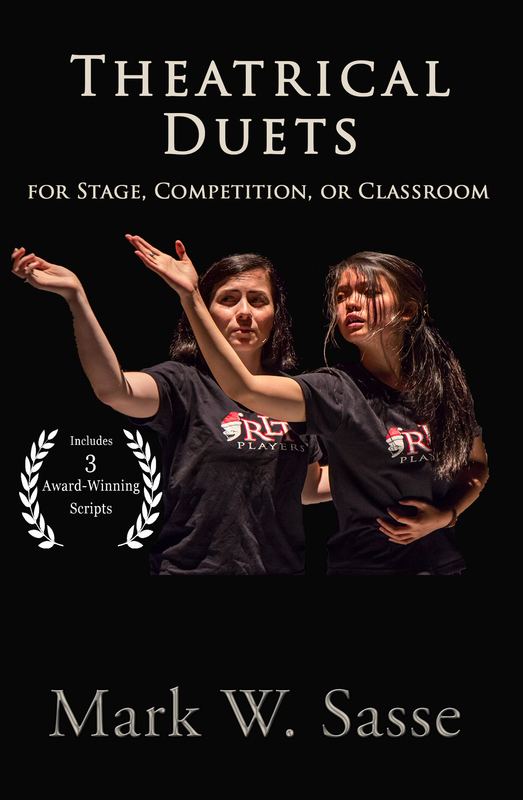 Here’s a great collection of duets which can be used for a variety of settings. It includes 4 award winning scripts, and 12 other unique, engaging, socially relevant scripts for all different settings. All of these have been theatre-tested in one way or another. I’ve used them in the drama classroom, for award-winning performances in forensics competitions, and as a part of serious theatrical performances. Versatile, fun, meaningful. Please check it out and pass on the link to the drama folks in your life! Thanks. My Script Chosen! Top 10 finalist in Davenport 10-Minute Play Contest! I was happy to see my brand new script “Safe Spaces” was chosen as one of the Top 10 finalists in the 4th Annual Davenport 10-Minute Play Contest! And now, you can help! Besides being judged by Broadway insiders, it will also be judged by readers. So the readers’ choice could help make or break a script. So please, head on over to the contest’s website and read this brand new script. It’s a satire about political correctness on college campuses. I had a lot of fun writing it two weeks ago on April 16. Yes, I wrote it in one day. I do things like that. The contest due date was April 17, so I may have cut it a little close. But hey, I made the top ten, so that’s cool! The contest site with all chosen scripts is HERE! I’d love to here your thoughts on my script! Thanks. Here’s the video link for my favorite young actors bringing home the silver medal at the SEA Forensics Competition using my new script, “Me, Myself, & the Bridge of Sighs.” I know I’m not biased, but I would have given them gold! Anyways, they were fabulous as usual. Enjoy this poignant performance by two bright shining talents.